Okay readers and cooks alike I just got a press release from Morton's about a cooking contest that is pretty simple and the rewards is a trip to Chicago and dinner with one of the founders of Mortons...no, not at Charlie Trotters...but Mortons. 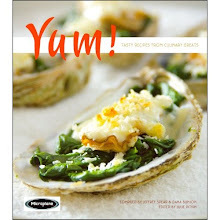 To Submit a Recipe and View Complete Rules, visit www.mortons.com/recipecontest. Contest Entries Must Be Received by June 2, 2008. (BALTIMORE, May 13, 2008) – Morton’s The Steakhouse, home of the “Best Steak Anywhere,” is searching for “The Best Recipe Anywhere” from its guests, aspiring chefs and anyone who shares Morton’s passion for preparing truly memorable meals with the best ingredients. The search for a winning recipe heats up this month with the first-ever Morton’s Guest Prime Recipe Contest. The best recipe will be selected for inclusion in Morton’s second cookbook, a sizzling sequel to Morton’s Steak Bible, which disclosed many of Morton’s mouthwatering recipes and grilling secrets for the first time. Guests of Morton’s and amateur chefs are eligible to enter the culinary contest, including people who have yet to experience the legendary food, service and hospitality of Morton’s, whose 79 steakhouses and 5,000 worldwide employees are celebrating the restaurant’s 30th anniversary this year. The winning “guest” recipe will be featured in the second Morton’s cookbook, which Random House is scheduled to publish in late summer of 2009. The grand prize winner will also receive an all-expense paid trip for two to Chicago and enjoy a special dinner at the original Morton’s steakhouse on State and Rush Streets, which opened on December 21, 1978. The host of this special dinner will be Morton’s Steak Bible author Klaus Fritsch, who co-founded the legendary restaurant with Arnie Morton 30 years ago. The second Morton’s cookbook will include more of Morton’s renowned recipes for easy preparation at home, as well as Morton’s expert tips on fine wine and spirits. To submit a recipe and view the complete rules for Morton’s Guest Prime Recipe Contest, visit www.mortons.com/recipecontest. Contest entries must be submitted by June 2, 2008. No purchase is required. A panel of experts selected by Morton’s will review creative recipes for beef, chicken or seafood entrees, appetizers, salads, sauces, marinades and dressings, soups, side dishes, desserts and even cocktails. What is Growing Faster Than Jack's Beanstalk?